Succumbing to the disease’s devastating consequences has become a way of life in certain parts of the world. But it doesn’t have to be, and for some populations touched by the Diabetes Wellness Program, it no longer is. Imagine children indulging in popsicles and soda or eating ramen noodles with Kool-Aid powder sprinkled on top for breakfast. Picture families dining on white rice, meat, and sweet beverages for lunch and dinner every day. What kind of meat? How about Spam, canned corned beef, chicken, fish, crab, octopus, and variety meats such as turkey tails or pig intestines? Where do people eat this way? While our focus here is the Marshall Islands, similar dietary patterns are emerging in impoverished nations throughout the Pacific and around the world. Located about 2,300 miles southwest of Hawaii, the Marshall Islands are 5 to 7 degrees north of the equator. With 29 coral atolls, including approximately 1,200 islands, the total land mass is a mere 70 square miles. One half of the country’s 60,000 inhabitants live in the country’s capital city, Majuro. An atoll of about 30 islands, Majuro is 30 miles long and has a land area of 3.7 square miles. The elevation is just above sea level. It would be difficult to design a diet that could more efficiently induce type 2 diabetes than the one the Marshallese people have adopted. Not surprisingly, the rates of type 2 diabetes in this population are among the highest in the world. An estimated 28% of individuals over the age of 15 have type 2 diabetes. For those older than 35, the figure is nearly 50%. Close to 75% of women and more than 50% of men are overweight or obese. Approximately one half of all surgeries performed on the island are amputations due to complications from diabetes. There are no facilities for renal dialysis. Sixty years ago, diabetes was virtually unheard of in the Marshall Islands. People were slim and physically active and lived off the land. Their diet consisted of fish, seafood, and edible plants such as coconut, breadfruit, taro, pandanas, and leafy greens. Breadfruit is a starchy fruit that grows on trees and is generally roasted on an open fire. Nutritionally, it is similar to white potatoes. Pandanas is a huge, extremely fibrous fruit that is chewed and sucked on to extract the carotenoid-rich, juicy orange pulp. Today, with considerable overpopulation in Majuro, approximately 80% to 90% of all food calories are supplied by imported foods. The most costly imported foods are fresh fruits and vegetables and other perishables, which arrive by ship every 28 days and by air every two weeks. In most of the outer islands, indigenous foods supply 50% to 75% of food calories. While health authorities promote local foods in urban centers, the supply of local plants on these small islands is insufficient to sustain the entire population. Many locals believe that when it comes to nutrition, the only thing that really matters is having a full stomach. The value of fresh fruits and vegetables is largely unappreciated. Local food is generally more expensive per calorie than imported food and less abundant since it’s dependent on the season and weather conditions. The cheapest source of calories in these centers is white rice. Many healthcare workers believe that white rice is responsible for the diabetes epidemic in the Marshall Islands. Some suggest that if the Marshallese replaced white rice with brown rice, the diabetes epidemic would be resolved. Unfortunately, it is not that simple. Some of the world’s lowest rates of diabetes occur in areas where white rice is a staple food. In populations where white rice is consumed with vegetables, tofu, and/or beans and the intake of processed foods is minimized, diabetes rates are remarkably low. On the other hand, where white rice is consumed with canned or fatty meat, salty snacks, sweet beverages, and other heavily processed foods, diabetes rates are consistently high. It is rather startling to learn that the glycemic index of the most commonly consumed rice in the Marshall Islands—Calrose white rice—is 83, higher than that of white table sugar, which has a glycemic index of about 68. However, it is even more startling to learn that the glycemic index of Calrose brown rice is 87. While brown rice is a better source of fiber, vitamins, and minerals, the glycemic index of rice depends more on the relative amounts of two main types of starch, amylose and amylopectin, than on the fiber or nutrient content. Low-amylose rice has a high glycemic index. Calrose brown rice has a slightly lower amylose content than Calrose white rice. While this does not make the white rice a more healthful choice than the brown rice, it does suggest that blood sugar control may not be favorably affected by merely exchanging Calrose white rice for Calrose brown rice. Replacing Calrose white rice with a high-amylose brown rice would seem a more promising option, although hardly a panacea. In 2005, Canvasback Missions Inc, a nonprofit Christian organization that specializes in medical missions to remote South Pacific islands, was awarded a grant for a lifestyle intervention diabetes research study. This study, conducted in partnership with the Marshall Islands Ministry of Health and Loma Linda University, was launched in March 2006. The first order of business for the diabetes wellness team was to convert a tuberculosis and leprosy clinic into a fully functioning diabetes wellness center, complete with kitchen, aerobics room, strength and cardio room, lecture room, laboratory, offices, and washrooms. The second was to establish all of the elements required for rigorous scientific research—a formidable task in a developing country with limited technology and a significant language barrier. English is a second language (the first language being Marshallese), spoken with various degrees of fluency by more educated Marshallese. Local personnel were recruited, interviewed, employed, motivated, and mentored to become support staff. Computer systems were set up, and a massive screening of patients was initiated. Protocols were established for lab work. Research forms, handouts, recipes, menus, and lectures were developed. Relationships were established with Marshallese and American dignitaries, Ministry of Health personnel, community group leaders, and store managers. Contact with team members living on the mainland was limited by a very costly phone service and a slow, unreliable Internet service. Next was the arduous process of enrollment. Participants had to meet strict medical requirements, be available to participate in most sessions, have a means of getting to and from the facility, and be sufficiently motivated to make profound lifestyle changes. This process is ongoing, as new recruits are needed for each intervention. The first four interventions were conducted in English, while the fifth was conducted in Marshallese. The first three interventions were conducted using a six-month model, while the last two were intensified and condensed to a three-month model. Each intervention began with a two-week intensive phase in which participants were provided three meals per day, exercise sessions, health education, cooking classes, and frequent blood sugar monitoring (four to five days per week). During the first three interventions, the two-week intensive period was followed by a month of twice-weekly sessions, six weeks of once-weekly sessions, and three months of bimonthly sessions. Interventions four and five were intensified and condensed. In this case, the two-week intensive was followed by two weeks of biweekly sessions, alternating with two weeks of intensive four-day sessions. The final six weeks included two twice-weekly sessions and four once-weekly sessions. Table 1 shows the five-hour evening schedule. All control group participants are guaranteed a place in the intervention group once their six-month control period is completed. • moderate sodium (less than 2,400 milligrams per day). Subsequent to the two-week intensive phase, boiled, steamed, or grilled fish and seafood may be added, if desired. A typical intensive phase menu is provided in Table 2. In addition to a highly therapeutic diet, participants receive daily education about nutrition and lifestyle. PowerPoint presentations, practical workshops, dine-outs, shopping tours, and cooking classes with spouses are all fundamental components of the intervention. To help increase access to affordable produce, participants are taught how to grow their own vegetables. Soil and gardening experts are brought in to conduct lectures and workshops, and participants are taken on agricultural field trips. Physical activity is a vital partner to dietary intervention. During the intensive phases, participants take part in a one-hour daily exercise class in addition to two daily walks: one before breakfast and one after dinner. Following the intensive phase, participants continue with exercise classes on clinic days and are encouraged to come to the clinic for exercise during clinic hours whenever they can. They are also advised to continue with daily walks, as well as strength and flexibility exercises, at home. While the program results have varied during the two years of the study, they are most encouraging. During the intensive phase (first two weeks) of the program, success was remarkable. Fasting blood sugars declined an average of 50 to 100 milligrams per deciliter (3 to 6 millimoles per liter); cholesterol dropped about 20 milligrams per deciliter (0.5 millimoles per liter), and triglycerides fell approximately 40 milligrams per deciliter (0.5 millimoles per liter). It is important to note that these changes were seen even with notable reductions in medications. Consistently, participants reported dramatic reductions or complete disappearance of pain in the legs, arms, and joints. The need for nightly leg massages was eliminated for the majority of participants. Walking became easier and more enjoyable. Many reported significant reductions in nightly trips to the bathroom. Most noticed tremendous changes in their bowel habits, with greater frequency and bulk of stools. Almost everyone reported increased energy. Several participants noticed significant improvements in mental capacity. Weight loss averaged 1 to 3 pounds (0.5 to 1.5 kilograms) per week. Changes after 12 weeks were more variable, with some participants making remarkable recoveries and others slowly regressing. Those who experienced regression were participants who stopped coming to sessions. Unfortunately, most of these individuals did not resume taking medications. While they generally improved their overall diet and lifestyle, without medications, lab values at 24 weeks were often similar to baseline. In an effort to avoid this outcome, the program was adjusted to increase medical follow-up and education regarding medications. Also, attendance improved significantly with the shorter, more intensive three-month program, and it is fully expected that this will be reflected in long-term outcomes. Plans to publish the research in medical journals are currently underway. Many participants completely transformed their lives and their health. Some have become health crusaders for their country. Many are politically active and are doing everything they can to change national food and nutrition policy. “I was bedridden all the time because, in my mind, I considered myself dead. I was skeptical about the program and told my wife that nothing could cure me. You see, I had a stroke and half my body was paralyzed. I had been in my bed for a year. I could not walk at all. Now I am proud to say that I can walk all the way to the supermarket without any pain in my body. I thank God for His plans to bring these doctors to our small island. 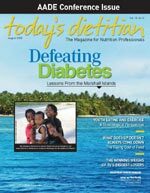 In the Marshall Islands, diabetes was long viewed as a devastating, terminal disease. No one was spared the pain of seeing family members, friends, and neighbors lose their vision, limbs, and lives. To witness recovery or healing from this condition was previously unknown. While program participants face barriers to success, they work closely with staff in overcoming them. Medical follow-up is expanding; social barriers are being investigated; store managers are carrying a greater volume and selection of healthful foods; restaurant owners are adding “Diabetes Wellness Program Approved” options to their menus; exercise opportunities are expanding; lectures and handouts are being translated; and Marshallese staff are being trained. Program participants have overcome seemingly insurmountable mountains of Spam, donuts, ramen noodles, and cola. They have managed to put together low-cost, healthful meals despite the high cost and poor quality of available produce. They have managed to do it with little education, marginal English skills, few gyms, no hiking trails, and limited access to fitness facilities. These pioneers are providing a powerful example of health and healing for the people of the Marshall Islands. They are providing hope amid a deep sense of hopelessness. Many people ask if this program could work in other countries such as the United States and Canada. The answer is simple: If there is hope in the Marshall Islands with the enormous barriers they face, there is hope at home. — Brenda Davis, RD, is the lead dietitian on the Diabetes Wellness Program. She is also the author of six books, including Defeating Diabetes.